Message: Thought you might be interested in this 2004 Luhrs 40 Open. The wide beam, Carolina flare, and a sharp entry of the Luhrs 40 Open combine to deliver a smooth, dry ride. The low center of gravity increases the stability in a seaway as well as when trolling. A large center console holds all the latest in electronics and instruments while it keeps the captain in the center of the action. Visibility is enhanced by the raised custom helm seat and the fiberglass hardtop, while the full enclosure protects passengers from the elements. Rigging the bait or handling the tackle is easy with the integral bait stations which include drawers, washdowns, and a sink. An insulated icebox or the livewell will keep the bait fresh and ready to go. 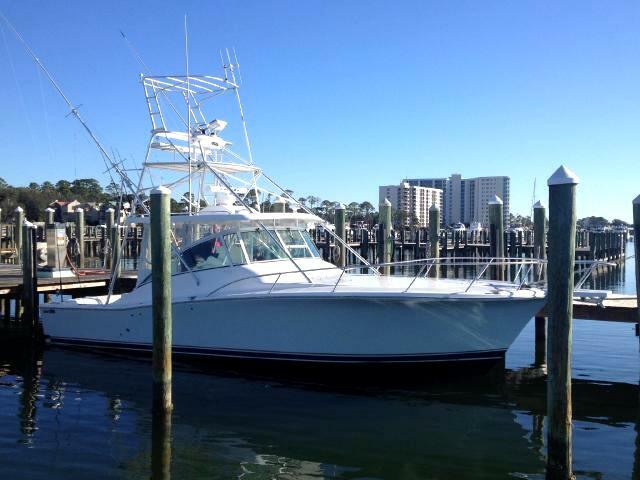 Standard equipment includes a full tuna tower complete with controls, instruments, seating, sunshade plus air conditioning, generator and much, much more. Inside and to port, the raised galley is covered with Corian, trimmed in hard woods, and includes all the finest in appliances. Across the way, the head with shower is fully fiberglassed for ease of maintenance while the Corian-topped vanity provides excellent storage. The salon is complete with a color television and VCR along with a stereo CD system. There is plenty of storage throughout and even a convenient sea berth is even included. Forward, the private master stateroom has an island double berth, hanging lockers, lots of drawers and a pair of reading lights. All this and more is wrapped in warm hard woods and beautiful custom fabrics.